Beethoven wrote this concerto, which is his last piano concerto between 1809 and 1811 in Vienna, dedicated it to Archduke Rudolf (8 January 1788 – 24 July 1831, a Cardinal, an Archbishop of Olmütz, and a member of the House of Habsburg-Lorraine), his patron and pupil. The concerto is scored for a solo piano, two flutes, two oboes, two clarinets in B-flat (clarinet I playing clarinet in A in movement 2; flute II, clarinet II, both trumpets, and timpani are tacet during this movement), two bassoons, two horns, two trumpets, timpani in E-flat and B-flat, and strings. 00:00Allegro in E-flat major. Despite its use of simple chords, including a second theme constructed almost entirely out of tonic and dominant notes and chords, the first movement is full of complex thematic transformations. When the piano enters with the first theme, the expository material is repeated with variations, virtuoso figurations, and modified harmonies. The second theme enters in the unusual key of B minor before moving to B major and at last to the expected key of B-flat major several bars later. Following the opening flourish, the movement follows Beethoven’s trademark three-theme sonata structure for a concerto. The orchestral exposition is a typical two-theme sonata exposition, but the second exposition with the piano has a triumphant virtuoso third theme at the end that belongs solely to the solo instrument (Beethoven does this in many of his concertos). The coda at the end of the movement is quite long, and, again typical of Beethoven, uses the open-ended first theme and gives it closure to create a satisfying conclusion. 20:40 Adagio un poco mosso in B major. The second movement in B major is calmly paced and delicate, being a standard contrast to the first movement. It moves into the third movement without interruption when a lone bassoon note B drops a semitone to B-flat, the dominant note to the tonic key E-flat. 26:39 Rondo. Allegro ma non troppo in E-flat major. The final movement of the concerto is a seven-part rondo form (ABACABA), a typical concerto finale form. The piano begins the movement by playing its main theme, then followed by the full orchestra. The rondo’s B-section begins with piano scales, before the orchestra again responds. The C-section is much longer, presenting the theme from the A-section in three different keys before the piano performs a cadenza. Rather than finishing with a strong entrance from the orchestra, however, the trill ending the cadenza dies away until the introductory theme reappears, played first by the piano and then the orchestra. In the last section, the theme undergoes variation before the concerto ends with a short cadenza and robust orchestral response. 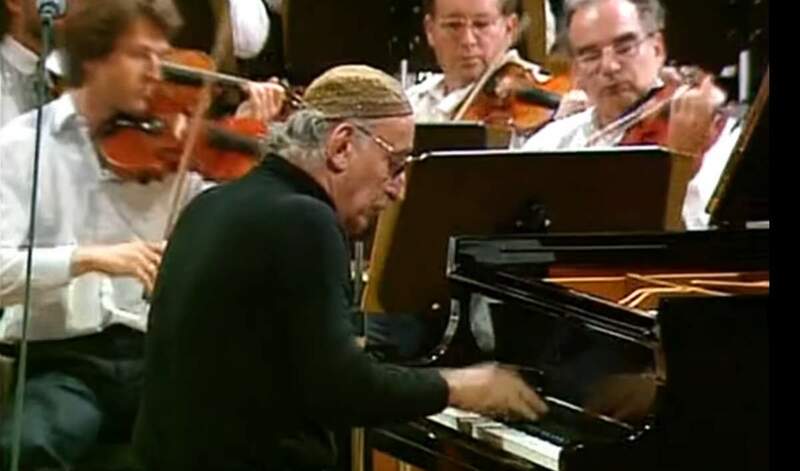 Although most famous for his Mozart and Beethoven interpretations, Gulda also performed the music of J. S. Bach (often on clavichord), Beethoven, Schubert, Chopin, Schumann, Debussy and Ravel. His recordings of Bach’s Well Tempered Clavier are well regarded by collectors. 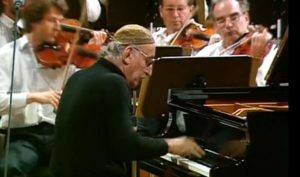 Apart from the Well Tempered Clavier, Gulda performed very few other pieces by Bach and recorded even fewer. Gulda’s later reliance on co-operating with companies whose recording techniques were primitive in comparison to those espoused by more sophisticated rivals stood him in very poor stead with regard to posterity. The rescued Mozart sonata tapes issued on DG are unbelievably bad in terms of recorded technical quality; likewise the Debussy Preludes and Bach recordings of the late 60s and early 70s.